Three competitors in the Quiksilver in Memory of Eddie Aikau Big Wave Invitational surf meet finished their ride on the same wave. 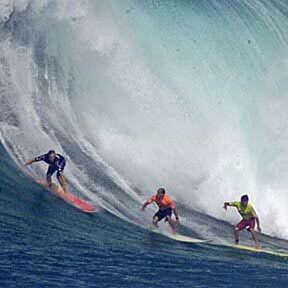 They were part of an elite group of surfers who caught 20- to 30-foot waves yesterday at Waimea Bay. Thousands of others clogged roads to watch the first big-surf show of the season. The surf was on its way down today but is expected to rise again soon.